Today I'm answering a few questions from my very nice commenters, as well as sharing a response to a question that I had asked. Don't your hands cramp when you quill?! Happily the answer is no. It can happen I suppose, if one holds the quilling tool too tightly and/or works for a very long period of time without pause. Let's face it, any type of repetitive motion can lead to injury. Remember to keep a relaxed hold on the tool and stretch your hands and fingers occasionally. You might want to tape padding around the tool handle for added comfort. It's a puzzle to me why all companies that produce tools don't routinely make them with ergonomically correct handles. I can't buy gilded-edge papers in my country... where can I get them? Those of us in the U.S. are lucky because most of our online suppliers carry gold and silver-gilded papers. There are two types: Touch of Gold and Touch of Silver have a subtle, metallic sheen along one edge and are produced by Lake City Craft Co. of Missouri. Gilded strips with lots of shine are imported from England's Jane Jenkins Quilling Design. Both companies ship internationally. In lieu of ordering, it's possible to add your own gilding by using a Krylon leafing pen or even a metallic gel pen. You might also try pressing a silver, gold, or copper ink pad against rolled coils for a gilded effect. My favorite at the moment is Elmer's Clear School Glue; it comes in a similar bottle to traditional white Elmer's. What I like about it is that it doesn't quickly develop a 'skin' compared to the white variety. My preferred method of handling glue is to put a dab on a plastic lid... then I dip from the dab - hee - with the tip of a paper piercing tool or T-pin. To glue coils and scrolls to a slick surface, such as glossy cardstock or the shiny, hard finish of jewelry, I use Crafter's Pick - The Ultimate. The 'more is better' philosophy of Victorian times resulted in women of royalty and aristocracy wearing multiple pieces of ornate jewelry. Since having one's photograph taken was not nearly as routine as it is now, a picture was considered quite precious. Worn as brooches, cufflinks, fobs and pendants, faces were mounted in non-precious metals under crystal or celluloid covers. By the turn of the 20th century, photography shops were becoming quite common in towns across the country. 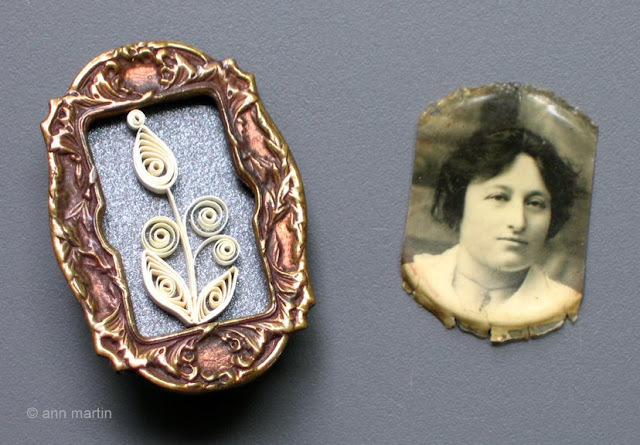 In addition to placing pictures in tiny shadowbox frames, a popular trend was to transfer images to buttons that were worn as pins. Thanks Blaize, and all of you for your questions! Hey Ann....I was at Archivers and thought of you today. While there I saw some stickers. They are called ancestral; they are framed domes stickers that you put old time photos in. They are bronze metal with a plastic dome of some sort that goes over the picture. Thanks Sue, they sound right up my alley.